Mama is 90-year-old Ruth Dennis — West Oakland resident, Alzheimer’s patient, and the funny, frustrating muse for “The World According To Ruth.” The first line comes from an entry by Dennis’ daughter, Jo Ann Bell. Bell designed the blog to chronicle her life with the woman she and their neighbors call Ms. Ruth. I have never met Ms. Ruth, but I feel like she could be my kin, or at least a friend next door. I’ve gotten to know her so well through Bell’s blog, which she created with Oakland Voices, the Oakland Tribune’s community journalism training program. As OV’s project coordinator, I’ve been lucky enough to have spent the last seven months editing Bell’s work, along with stories by more than a dozen other talented community writers. We’ve grown into an impressive media team since our launch in April. The OV crew was on the ground all night after the Johannes Mehserle verdict fallout. I’m still applauding the journalistic instinct, creativity and poise our correspondents showed that night. Oakland Voices has covered a turf dance face-off, a neighborhood stir over eminent domain, a re-entry program for former convicts, and a West Oakland Museum devoted to black art from around the world. We’ve taken on suicide, gun violence, environmental justice, plus health and diet. Everyone has done this with their spare time. For most of our folks — people with jobs, sick parents, school, kids and grand kids to look after — spare time was at a premium. Oakland Voices has been a lot of work, and they pushed those obligations to the side regularly, to come, to learn and to create. We launched OV last spring at the West Oakland Public Library with a clear mission. The program would spend half a year providing a select group of people from in and around West Oakland the training, tools and platform to tell their communities’ stories in their voices. After some storytelling and journalism boot camp-type training, the correspondents fanned out across the city. They talked to neighbors, friends, business owners and strangers on Oakland’s sidewalks. The aim was to find snapshots of Oakland — the beautiful and the difficult things that make life here complex and dynamic. Then our correspondents would write their pieces, I would edit, and they would rewrite until the stories were strong enough to post on our website or in the Oakland Tribune. Naturally, this process wasn’t always the smoothest. The things we learned from both the snags and the victories are manifold. We learned to let communities speak. Oakland Voices was created to help solve problems of coverage. We believed, and still do, that professional journalists aren’t always the best at getting to the core of stories buried deep inside neighborhoods. We had a theory that if we could find talented people from those neighborhoods — those who have the social literacy in, access to, and trust of their communities — they could get at those stories. They could be liaisons, we dreamed, advocating for their neighbors while they also acquire media skills to take with them once they finished our program. As an editor, my challenge came in moving out of my journalistic rigidity and letting our correspondents speak with authority about the experiences in their worlds. After all, that’s why we accepted them into the program! My stylistic manacles were routinely spotlighted as big, clunky handicaps. To break myself free and to let Oakland Voices truly shine and live up to its mission, we basically had to relax, revamp our expectations, and let the correspondents put much more of themselves into their creations. I’m indebted to each one of our correspondents for pushing back. “I am Oakland Voices!” one of our writers once deftly reminded me. Oakland Voices is having a graduation ceremony in mid-November, when I will tell the participants how proud I am of what we have created together. Here is some of what I want to turn to them and say: I started my journalism career almost a decade ago with National Public Radio, where I got to work with some of the best storytellers in the industry. Few of them ever challenged me the way you all have to understand the value in giving space and voice to real human experiences. Since the project started in April, Oakland Voices has had one baby, a couple of graduations, a rough car accident, and seen the start of a college career. Two participants have been published right here in the Tribune. One of our correspondents is suffering through a family member’s decision to join a gang, and another is coping with her son’s murder. I say goodbye for now, because our aim is to keep the project going in the near future. Watch our website for updates. 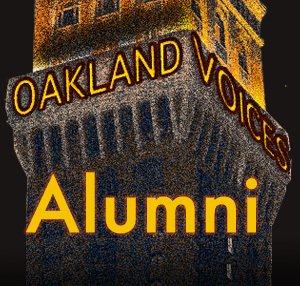 In the meantime, spread the word about Oakland Voices. Consider applying for the next round. Read and comment on our stories, letting us know what you think. Send us things to cover; we’re always open to new story ideas.